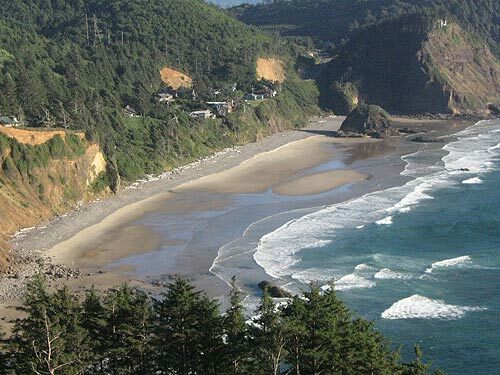 (Oceanside, Oregon) – Cape Meares and its lighthouse is the famous older brother, and the nearby tiny town of Oceanside is a mix of delicious secret and center of attention – for those in the know. But between those two stretches it's Radar Loop Road which yields a bevy of beachy wonders and often seriously unknown delights. (Photo: above Oceanside from a very secret spot). Get ready for some spectacular surprises. (Advisory: as of this writing in early 2015, the northern end of the road is closed and only accessible from the southern approach). 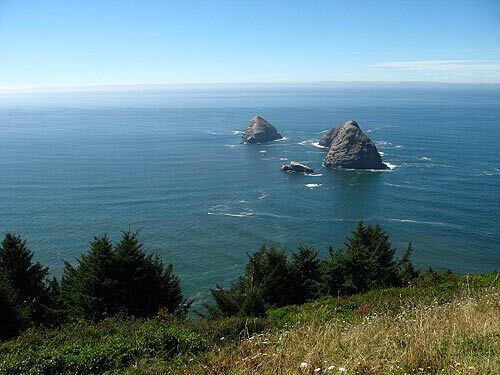 At the northern end of the Loop, the fun all starts about nine miles from Tillamook, at Cape Meares. A lighthouse, a weird natural anomaly and a few hidden trails all create a whole new world to explore in this relatively small State Park – all a trifle north of MP 4. 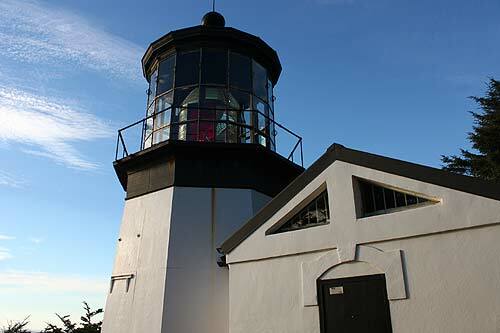 Take the paved walkway to the Cape Meares Lighthouse, a stumpy specimen that is the smallest lighthouse on the Oregon Coast, standing only 38 feet high. But size isn't important here as it stands on a 200 ft high cliff, more than making up for its own lack of height. From Cape Meares, it’s a few short miles down Meares Loop Rd. to a wild little clandestine beach called Short Beach. Look for Radar Rd., just a tiny bit north of MP 4. 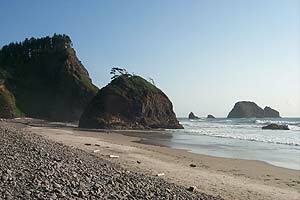 Short Beach (which once boasted an actual radar station) is chock full of scenic yumminess, starting with the large, bulbous rock structure plopped at the tide line, sporting a small patch of trees on top. On one end of the cove, the weird rock structures near Oceanside poke out from behind the cliff. At the other end sits the Cape Meares lighthouse and another small sea stack. A massive waterfall spills gently into the ocean - just out of reach of the beach, and there's also a rocky cove within this cove. 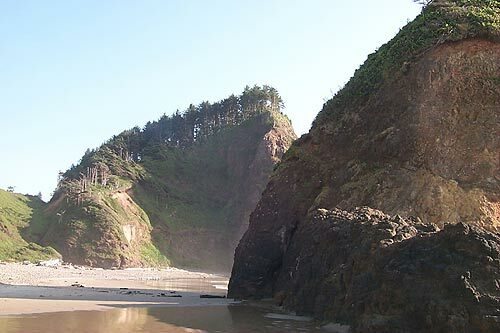 Access to this awe-inspiring Oregon coast beach is through a sprawling, wonderful creation called the “stairway of 1000 steps,” put together by locals to keep people from busting their heads, as they did via the old access, which was a precarious slippery slope of mud. Above Oceanside is another stunning discovery that’s not very well known. At the very top of town sits a gravel patch the locals don’t want you to know about. From here, you can actually look down on the famous Three Arch Rocks. 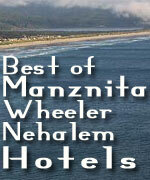 It is the single most expensive chunk of real estate in all of Tillamook County. This is accessible from a meandering, gravel road that connects from Meares Loop Road. Along the way, some charitable local soul has built a small bench on the edge of the roadway with the words ``Enjoy'' inscribed on it. Enjoyable indeed, but that word doesn't quite cover what you'll get out of this: the bench is brilliantly placed so you can obtain a stunning view of the Pacific Ocean as well as Short Beach to the southeast. 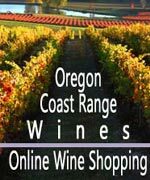 More on this area at the Oceanside, Pacific City, Three Capes Virtual Tour, Map.